The New Canaan Fire Department building has stood at the corner of Main Street and Locust Avenue since June 1938. 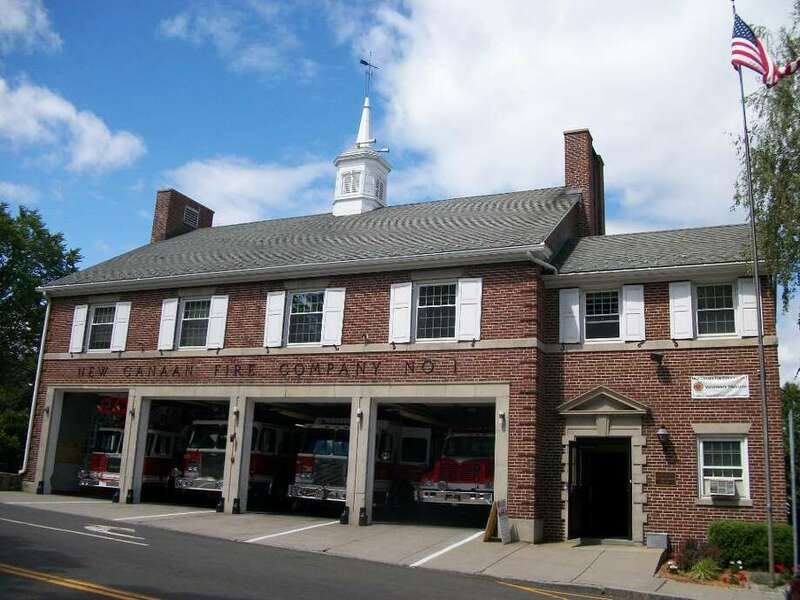 A lot has changed since the New Canaan Fire Department first moved to its home at the corner of Main Street and Locust Avenue in 1938, according to Assistant Chief Jack Hennessey. Back then, the department was still run by volunteers, as opposed to the full-time firefighters it now employs. There was no need for sleeping quarters; office space wasn't a priority either. There was no such thing as the Americans with Disabilities Act, nor was there a need to accommodate female firefighters. As a result, the 72-year-old brick, Colonial-revival building does not have elevators, and is not ADA-compliant. There is no women's locker room or bathroom for the female volunteers, Hennessey said. The six men who sleep at the building each night share one small room, which Hennessey said resembles a barracks more than a bunk room. Three employees, Hennessey included, share the lone office on the house's second floor. "This is an old building," Hennessey said. "It either needs a major renovation, or a replacement." The department enlisted a consultant about a year ago to make some basic proposals for a new fire house. "It's time to make changes, whenever the town has the resources to do so," he said. "There's been a lot of talk, but nothing official." Last month, the library board brought forth a proposal to create a more efficient town center by renovating, replacing and relocating several of the town's buildings, including Town Hall, the library, Board of Education's central offices, Human Services, the Outback Teen Center and possibly the fire house. First Selectman Jeb Walker has publicly stated that he is in favor of reorganizing the town. While he has not yet introduced a specific proposal, he has organized a committee to launch a 12-month study, which will document the facilities' shortcomings and possible solutions. "While in the past we have looked at various projects individually, such as the Town Hall renovation, expanding parking and upgrading downtown, the need for a new library is a catalyst for action," Walker told the New Canaan News when the project was unveiled. Combining several of these projects presents financial benefits, he said. "Because of the economy, it's cheaper to borrow money right now, and construction costs are down," Hennessey said Wednesday. "It's the optimum time to have large construction projects, and there might be federal money to assist in the construction." But he's not sure whether the fire department is high enough on the priority list to benefit from the proposed shuffle, he said. "The library project was a surprise for a lot of people, and it will reshuffle the cards a little bit," Hennessey said. "The library probably lowered the priority of the Fire Department," he said Wednesday. "It looks like the library is at the top of the list right now, and Town Hall is next." But the decades-old firehouse is "past its prime," according to Hennessey. When it was constructed in 1938, the fire house was home to much smaller trucks, he said. These days, the trucks are much longer, higher and wider -- not to mention heavier than the apparatuses the department was engineered to hold. "Our doors are very small," he said. There are places near the Main Street doors where trim has been knocked off due to engines pulling in and out of the bay. One of the doors has been renovated to accommodate a bigger truck, but clearance can still be an issue, he said. In snow storms, the sidewalks in front of the firehouse have to be meticulously shoveled, according to Hennessey. Just a couple inches of packed snow between a truck's tires as it drives through the doorway can make the difference between clearing the ceiling and damaging the truck or building, he said. "The trucks are getting bigger and bigger," he said. "And the tanker can only be parked in the basement; it's too heavy to be parked on the main level." Renovating the building to enlarge the doors is an expensive project, Hennessey said. And it's not just the doors that pose a problem. Last January, a new law was passed that will require new fire trucks to meet more strict EPA standards. This means all new trucks purchased will need larger, cleaner-burning engines. It's a change that requires fire departments to purchase trucks that are slightly longer, and possibly wider, according to Hennessey. The regulation does not require the department to purchase new trucks immediately, but mandates that all future trucks comply. "We've been trying to replace trucks for the last three years, and we're actively seeking a new pumper," Hennessey said. The current fire house is larger than it was when it was first constructed. A roughly $165,000 addition was constructed in 1965, according to documents from the New Canaan Historical Society. Back then it was said that the addition would leave room for 10 trucks in total: seven on the Main Street level and three on the Locust Avenue side. But that estimate has shifted along with the size of trucks. Currently, the department houses six trucks there, and space is still tight, according to Hennessey. Another addition wouldn't make as much sense as relocating the department to a new facility, which is engineered to hold the weight of modern trucks, Hennessey said. Potential locations include the Locust Avenue parking lot, and the town lot that is currently home of Vine Cottage. "It might be combined with a parking facility like the new Danbury Police Department. It could be a combination facility, or just stand alone," He said.